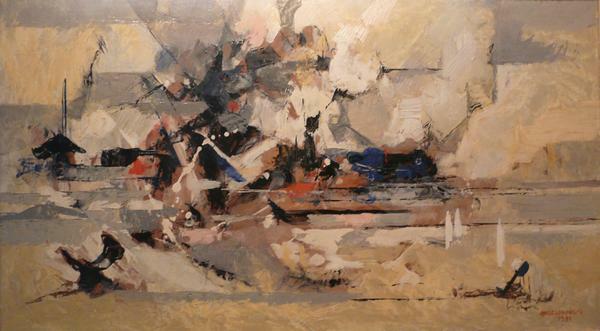 An Abstract oil on canvas, Signed LR "Angelopoulos", Canvas 26.5" X 15" + frame. He was born in Volos , and was the eleventh and last child of a Volo's family. Shortly after birth has lost his mother. Received its first painting lessons close to compatriot John Poylakathalassografo. In 1916 he lost and his father, so he decided to leave for the Mansoyra of Egypt, where lived a brother. In 1918 he went to Alexandria to study close to the painter Dimitri Litsa. From 1924 to 1930, ventured in Munich and Paris, to get to know contemporary tendencies of paintings in academies, art galleries and museums. In 1930, he moved to Alexandria and pioneered the establishment of the Cultural Center "L'Atelier", which evolved into attraction and reference point for Mrs. litechniki's Greek community and life of the whole city. During World War II, he became acquainted with the Stratis Tsirkas and participated in activities to help the Greek people, who suffered from the hardships of Occupation. From 1955 to 1960, he served as Director of Painting at Area Technical Institute of Khartoum in Sudan. In 1960, he left Sudan to permanently installed in Paris. In Paris, Angelopoulos met and married the French painter Lily Masson (Lily Masson), daughter of the famous surrealist painter André Masson. Came into contact with the more contemporary currents of the time and so he quit for a while, the oil paintings with portraits and landscapes, to turn to the more abstract collage. A few years later left and abstract artto create landscapes inspired by the Parisian landscape, but also the Mediterraneansea. The landscapes those, stand out for their photographic realism and their unique Mediterranean light. In many of the past his paintings portrayed the contemporary middle-class guy to direct himself some anazi vent on city streets. Angelopoulos's works were presented in numerous solo and group exhibitions in Egypt, the Sudan, Italy, to France, in Luxembourg and Greece. Among other things, in 1951 he participated in the Venice Biennale, the period 1952 to 1954 at the Biennale of Alexandria, in 1962 the report «Greek painters and sculptors of Paris " at the Museum of modern art of the French capital, and in 1983 at an exhibition in the National Gallery of Greece. In 2007, in his home town, the municipality of Volos honoured him with a retrospective exhibition of his works. By his first wife had one daughter, Hebe architektonissa Angelopoulos, and the last had a granddaughter, also artist Marigo Blaikoy.